In many tropical countries, tomato production can be dramatically impacted by soilborne pathogens, impacting the livelihoods of rural families. The most limiting soilborne pathogen in the tropics is Ralstonia solanacearum, bacterial wilt. Tomato grafting technology is a proven technology increasingly adapted worldwide to reduce risk of soilborne pathogens. Grafting produces a physical hybrid plant, with rootstock chosen for its genetic ability to resist soil borne disease, and scion chosen based on fruit quality for commercialization. The technology is relatively simple, but can have a huge impact in providing more sustainable production and added value to small-scale growers. Grafting thus creates an opportunity for entrepreneurial groups to specialize in the production and sale of grafted tomato seedlings, as do many small greenhouse-based businesses in the United States. Through a previously completed project, we identified and commercially produced fruit and seed of AVRDC cultivars that combine resistance to Begomoviruses with fruit quality characteristics necessary for commercialization. We propose on-farm field trials with women's group to validate the technology and identify the optimal rootstock-scions combinations. 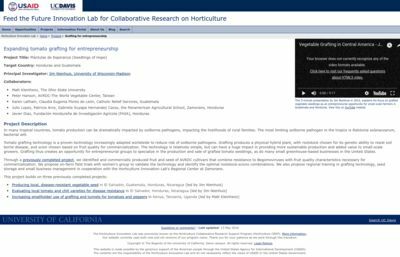 We also propose regional training in grafting technology, seed storage and small business management in cooperation with the Horticulture Innovation Lab's Regional Center at Zamorano.